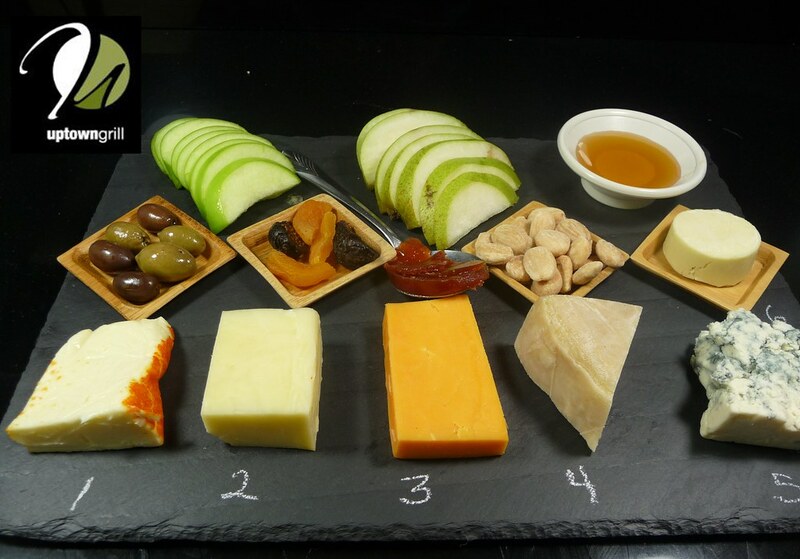 Our artisanal cheese sampler has always been one of my favorite appetizers... one I think many people forget about. Over the years, we have enjoyed some amazing cheeses from all over the world. Then once every few months, we bring in several new cheeses. The day they come in is almost like Christmas for us. We all get to watch as Chef Chris opens the boxes... then comes all of the ooo's and ahhh's as we check them out! Of course, we all get to sample and discuss each cheese. #1 Saint Rocco Triple Cream Brie: This is a very rich, triple cream cheese with 70% butterfat. This spreadable cheese has a creamy and slightly earthy taste. #2 Queso de Murcia al Vino: This fatty goat's milk cheese is from the province of Murcia in Spain. The cheese has an agreeable creamy flavor, a slight saltiness and a mild aroma. Murcian wine cheese is colored white to light cream and has a compact and elastic texture. This cheese enjoys a red wine bath that coats the rind, however, not permeating into the cheese. #3 Queso Mahon-Menorca: This is a soft to hard white cheese made from cow's milk. Mahón has some characteristics specific to it, despite aging. In general, the cheese is buttery sharp, slightly salty and lightly aromatic (sweet and nutty aromas) in taste. Mahón's sweet and fruity, yet slightly salty taste is due in part to the sea salt content in the grasses the cows eat. The rind is generally an orange color due to the rind being rubbed with butter or oil, and paprika. #4 Milton Creamery Prairie Breeze: A well-aged dry white Cheddar style cheese, aged for a minimum of 9 months, made with vegetarian rennet and no added color. Sweeter than your typical cheddar with lots of flavor, crumbly yet creamy with a little crunch from the calcium crystals developed during the aging process. Made in Milton, Iowa, this award-winning cheddar uses pastured, hand-milked cow's milk from local Amish farms, all within 15-miles of the creamery. The cheese is a unique hybrid-style - an Alpine cheddar - that combines sweetness and nuttiness in equal parts. It's balanced, medium sharp and you'll find some subtle grassy tones as well. This cheese has won numerous cheese awards over the last few years. #5 Rogue Creamery Smokey Blue: This blue is a classic Roquefort style cheese and is the worlds' first smoked blue cheese. The smoking process releases a sweet, creamy smokey flavor that balances both the sharp flavor and sweet creamy taste. The wheels are cold smoked for 16 hours over local hazelnut shells and then cave aged at least 6 months. Sweet cream flavors and caramel notes balance earthy flavors of smoke and hints of roasted nuts. This is a very interesting cheese and a must try to experience these two flavors. Be sure to check out our artisanal sampler or simply choose any one of these new cheeses we have brought in the next time you stop in. It is quite interesting and fun experiencing all of the different flavors and textures of cheeses from around the world. Excellent with a glass of wine and a few friends to discuss all of the different pairings we offer on the sampler!